You know when you convince yourself that you can indeed carry that very large pile of laundry up the stairs in one trip without the laundry basket? Because the laundry basket has been lost to the cause of either being a bed for a cat or to a toddler to commandeer? And so you begin the trek up, full of confidence. And then a sock slips out. And then you pick it up. And then two more shirts drop. This slapstick like scenario continues. Then, finally, for 4 amazing stairs, you actually do keep it all together. And you feel all smug, because you totally did indeed succeed in making it up the stairs with the ridiculous sized load in one trip! Trying to make this smoothie was a similar production. This smoothie is the one that almost didn't happen. Oranges were obtained, then lost to a little guy with a fickle appetite. All the oranges. Ginger was assumed to be sitting peacefully in the crisper drawer, hanging out with carrots and celery. But it wasn't. I had never picked it up. Then ginger and oranges were all ready to go, but we repeated the ginger episode with the pineapple. Finally, luckily, all these things came together. I felt all smug, having finally succeeded in corralling all the necessary ingredients together, and making a smoothie that should have only taken 10 minutes to begin with. Place everything in a bowl and blend with an immersion blender (or place in a blender and blend). Serve over crushed ice if desired. Looks yum, I love smoothies with pineapple! This smoothie looks great! I love anything with pineapple and oranges in it. PS: Your carrying the laundry up the stairs story reminds me of trying to fold the laundry with 2 dogs in the house (they are constantly stealing socks or unfolding what I've just folded). Sometimes the "easy" things just aren't that easy. Perfect way to hold onto summer sunshine! hahaha!! What a great description. I can completely relate! Hahaha totally been there. This smoothie sounds delicious!!!!!! Haha, I've totally had days like that! Sounds worth the trouble, though. Yum! Oh yum! I would gladly wake up to this! Looks delicious! Slurp...!!! That's the story of my life. What a yummy smoothie! Awww. I feel you with the laundry. My dog just wants to steal all the clothes and fling them around the house. This smoothie looks yummy. Ginger is the most forgotten ingredient in my household. I always think I have it and never actually do. Hahaha, you have defeated the smoothie. Good, too, because I want some! I know what you're talking about!!! the smoothie looks delicious, like the ginger! Oooh this sounds like a fabulous combo of flavors! I've never put buttermilk in a smoothie before. That plus Greek yogurt must give it a very decadent feel. 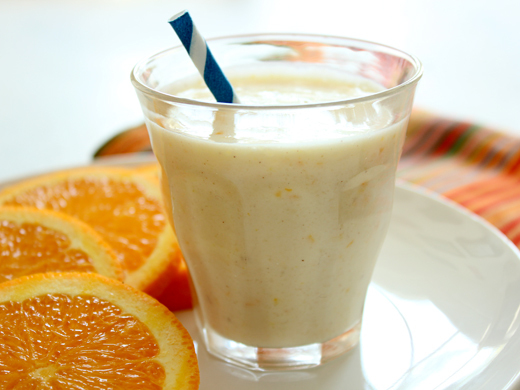 Love the flavors in this smoothie! It has become cloudy here and can rain anytime. Send me some sunshine. Love all the flavors going in it. Buttermilk in a smoothie? This must be so rich!!!!!! Yum!! I'm so glad that this smoothie came together. It sounds amazing and I'm just at the point of needing a new one for my rotation :) Happy Weekend! So funny when things don't come together like that - you think you have stuff/or have stuff planned and something thwarts you. This smoothie definitely reminds me of sunshine and I like the ginger accent. Ooooh, I love that you added buttermilk to this smoothie. I bet it gave it an amazing tang. Love the combo of flavors. Yum!Definitely going to try this. Sounds like a really delicious smoothies! Your story is very similar to mine. :) I need to keep this recipe because I love having buttermilk recipes around for the time we have buttermilk in our fridge!